Within the past two weeks, I have been a driven Christmas shopper. I cringe as I think about my credit card bill at month’s end. I have savings for but it still will be a jaw dropper. As I have been gathering gifts for others in my closet and mentally going through the wish lists, I have come to the conclusion that this Christmas has a theme. Unbeknownst to the people on my gift list, this theme has everything to do with Comfort and Ease. Without going into the gift list (just in case prying eyes may see this), 99.9% of the gifts that I have bought, could bring some comfort or ease to a person’s life. Think snuggly, warm things. Or gifts that make a persons life a bit easier. I didn’t intend to go this direction but honestly, maybe it is me that needs some comfort and ease right now. If I need some, perhaps others do as well. I am not going down that political road, but there is a lot of unease out there. Whatever party, candidate, religion, ethnicity, gender, sexual persuasion, and multitude of diversities that exist in our world, we could all use some comfort and ease. Think of your own wish list and what three things are most important to you? This may translate to a material gift you give yourself, an experience that you will have, or even a relationship that you develop with yourself or another. What do you seek this Christmas? From standing mountain, inhale and bring arms out in front, continue to inhale as you swing arms horizontally by your side, then continue with inhalation as you again swing arms out front, finally exhale as you forward fold and arms come down towards the floor. Repeat at least 6 times and on the final exhale, hang there limply enjoying the energy you just created through breath. As with any breath, if you begin to feel lightheaded, return to a neutral position and your normal breath. Benefits: great transition for decompressing the mind and body. Energy flow to the urinary tract, digestive and reproductive organs. Relaxes the back and releases tension in the neck. Place a block at lowest height and rest the bolster on it horizontally. Sit on a blanket in front of the props and swing your legs over top of the bolster. Adjust the height of the set-up to fit your legs. If your feet do not reach the floor, add a blanket or block. Before folding over the bolster, extend the spine on an inhale and then fold over. Rest hands either on the bolster or on the floor. Add support under arms and wherever else needed. Forehead rests on bolster maybe adding a neck roll. Stay for 5-10 minutes. Variations: To ground legs, blanket or sandbag to hang from soles of the feet. Strap can be placed around calves, so you lose the feeling of holding up legs. Tight hamstrings or really uncomfortable with legs directly up the wall? Try a bolster angled into the wall to rest legs on, add blankets for more support or move hips further from wall. 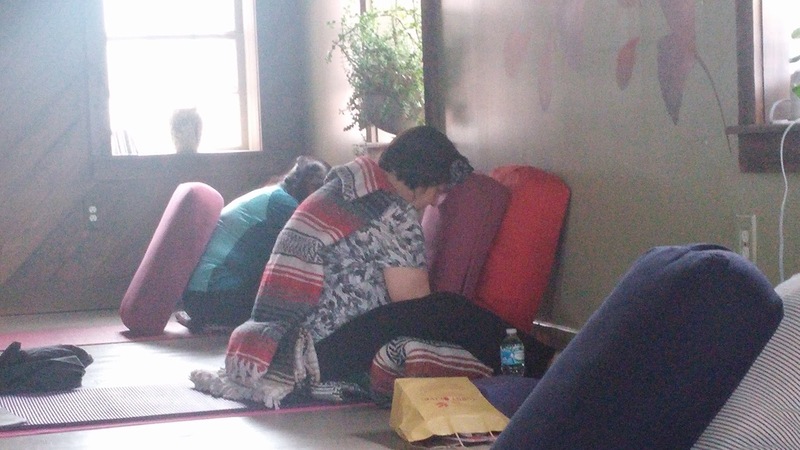 Another variation is Legs up on a Chair or on a bolster with blankets on top to bring knees into a 90 degree angle.